1. Can I buy something off the shelf or do I need a custom design? If you perform daily or phase maintenance on a helicopter or fixed-wing aircraft, chances are good you can buy a platform off the shelf and have it perform exactly as you need. Aircraft maintenance stands typically adjust to meet all your access requirements and are designed to interface with the unique shape of your aircraft. There are a few times that a custom design may be required, however. For example, if your aircraft is modified from a standard model, stock platforms may not provide the access you need, or they may provide obstacles for proper platform placement. Or if you use special tooling, it may not interface with an off-the-shelf design. Even when buying an off-the-shelf platform, be sure to review the model to ensure it will provide the access you require. 2. Should I buy a deployable maintenance stand? Deployable maintenance stands are designed for quick and simple breakdown and assembly. They are ideal for use in theater or other situations where the ability to tear down and transport the platform is crucial. However, they are often more expensive than standard platforms, and they may be less user friendly. For most facilities, deployable maintenance stands are unnecessary. 3. Should I get an aluminum or steel maintenance platform? There are benefits to both, but typically aluminum maintenance stands are preferable. They are lighter and easier to move, they don’t rust, and they are structurally strong enough for virtually any maintenance situation. For more information on this topic, you may want to check out Industrial Work Platforms: Aluminum or Steel? 4. What OSHA or other safety requirements are there? A lot. 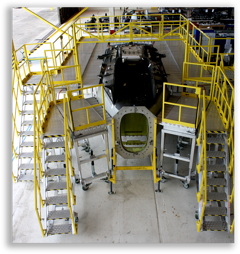 Aircraft maintenance platforms are often purchased to ensure OSHA compliance when working at upper levels. However, if the platforms aren’t designed to meet OSHA specifications, you may be putting yourself at risk for employee injuries and OSHA fines. Requirements range from handrail height to load rating specifications to stair tread material. Be sure to purchase your platform from a manufacturer that will guarantee OSHA compliance. If you built your own platform or aren’t sure about the compliance of one in your facility, you may want to check out Five Key OSHA Standards for Work Platforms. 5. What kind of maintenance requirements are there? Good news! Aviation maintenance stands, especially those made of aluminum, are virtually maintenance free. Look for ones with self-lubricating bushings, sealed, self-lubricating bearings, and manual or electric actuation, and your only maintenance requirements will be regular inspections to check for damage. 6. How do I store them? One concern, especially in smaller facilities, is the ability to store maintenance stands out of the way when not in use. For bigger, bulkier systems, this can certainly be a problem. Look for smaller footprint platforms with modules that can easily be broken apart and stored separately. For example, a platform with a self-supporting staircase stores much more easily than one with a staircase that must remain attached to the deck. Those self-supporting staircases can often be used as independent work stands, an added benefit of the design. This is always the biggest question, and to be honest, quality aircraft maintenance stands aren’t cheap. Smaller daily maintenance stands typically range from $10,000 to $30,000 off-the-shelf, while larger, depot-level maintenance systems can cost between $70,000 and $200,000 off-the-shelf. The cost reflects the size of the platform as well as the level of quality. In addition to the cost of the platform, you should consider shipping costs and any set-up and training desired.